One of the most magical experiences I had on Yule happened a few years ago when I was about twenty-eight. At the time, my husband and I lived in Phoenix, Arizona, just a few miles from a gorgeous protected piece of desert called White Tank Mountains. In the blue hues of a chilly pre-dawn Yule, we drove through the silent desert to hike one of our favorite trails, the towering saguaro cacti acting as sentries in the stillness of the sacred morning. To the soundtrack of coyotes yapping, we hiked to a precipice that allowed us to overlook The Valley of the Sun. In the distance the twinkling lights of a groggy city stretched across the horizon, but before us was the untouched splendor of the Sonoran desert. The woodsy scent of creosote bushes kissed the chilled December air as we stood atop the overlook, watching in wonder as the cool milky colors of twilight warmed with the nearing dawn. Quietly, with a cup of hot coffee held between mitten-clad hands (the true desert—not the concrete-laden city—can actually get quite cold), we stood in awe as the mountains across the valley birthed a blessed Yule sun. It was the first time I ever really made it a point to appreciate the sunrise, and I was left breathless by it's ethereal beauty. It genuinely looked like a birth, the fiery blaze of sun slowly materializing from the red dirt mountains in a transcendent progression akin to life emerging from the womb. Too early and brisk for most hikers, we were alone with nature, the elegant mule deer and chatty coyotes left to their own devices, thus far undisturbed by the influx of city-dwellers hungry for nature. It was in that moment, as I watched the proverbial birth of the God beside my husband, that I felt the sacred hum of the earth, the beat to which we all live, and the sheer magnitude of life. As physical beings, humans are quite small in relation to the world, and yet we are powerful, gifted with a divine connection to that which makes life worth living. I think of that significant morning every Yuletide season, hoping to relive that moment as I once again bundle up to watch the sunrise. For now, nothing has compared to the first time I ever really gave the sunrise true appreciation. But like an adult forever chasing the magic of Santa, I still believe. I still chase. I still experience that gentle vibration of essence as the morning breaks on a chilly Yule day. Like much of life, it's rare to eclipse the first time something truly magical happens, but that doesn't take away from each breathtaking time we try. As with any sabbat, I encourage you to go outside and simply be. We don't get enough of that in our hectic modern era, and you certainly shouldn't wait until you're twenty-eight to fully appreciate a sunrise. ...I blame it on the fact that I am not a morning person. It's an unspoken rule in our house that if you speak to me within thirty minutes of waking you'll receive nothing more than a closed-mouth murmuring as a reply. 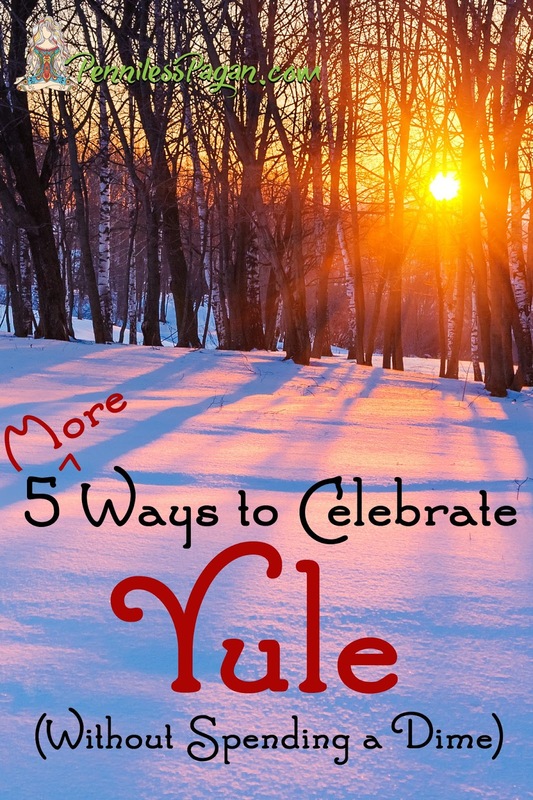 If you're in the mood for a more festive approach to Yule, here are five ways you can capture the joy of the winter solstice without spending a dime! And if you'd like to discover more information about this restful sabbat, check out this post for more details! For most people, December is a cold month. Warm up with a hot mug of tea and honor the God by making that bad boy ginger tea. Curl up by the fire and relax. After all, Yule is a sabbat of respite and restoration. Take some time to chill! Too cold to go outside? Meditate in the warmth of your home during the sunrise! Before our phones pinged with constant alerts and we were expected to conquer the world, winter was seen as a time of deep restoration and reflection, particularly during Yule. Take this morning to honor that ritual and do a little self-reflection through meditation. If you're not very comfortable with meditating, you can find many guided meditations on Youtube. Remember those pine cone bird feeders you made as a kid? Whip up one of those peanut butter creations and hang it from an evergreen. Or decorate an outside tree with edible gifts such as apple or orange slices, whole peanut or cranberry garlands, and nourishing suet cut into festive shapes with cookie cutters! The winter birds will thank you! Take a nature walk and collect fallen evergreen bows for a handmade wreath. Or gather up those pine cones for a Yule altar. Honor the sabbat and lift your spirits by bringing a little bit of nature inside during this otherwise barren season. Take a few moments on this quite December morning to reflect on the year past. What lessons did you learn? What challenges did you overcome? What accomplishments are you proud of? What heartaches would you like to release? Don't get overwhelmed or feel like you need to start a to-do list. Now is not the time to begin a New Year's resolution pamphlet (which no one on the planet has ever actually adhered to). Simply reflect. Over a warm mug of tea and a sugar cookie, of course! Such a beautiful post with wonderful ideas. Thank you so much for sharing. I feel like you specifically wrote this post to convince me to watch the Yule sunrise this year :p Well, it worked. How can I not want to experience the awesomeness you described? I'm going to attempt it. There won't be any coyote chatter or saguaro cactus sentries for me, but I'm sure the sunrise will be just as magickal in a sleepy deciduous forest. I love the pine cone idea! Definitely going to do it; I already have all the ingredients on hand. Thank you for more amazing ideas, Michaela. Have a joyful, peaceful Yule! What is important is that we evolve our own meaningful tradition. I live in high desert southwest. Due to life changes, I moved into town so I don't have the bonfires any more. There's still the solstice stew bubbling on the elec range and not atop the woodstove. There's still candles, walks under the moonlight, and enough pinecones and natural objects just lying around to make something seasonal. It's always been a quiet contemplative time keeping some semblance of the ancient traditions, at least as much as we know about them anyway. Learning the history and the old rituals and tradition then applying what resonates/works in my life is what's important to me. Stay away from that artful deception and consumerist drumbeat of the mainstream. Blessings! Can I come celebrate at your house?! Hahaha. That sounds like such a cozy way to honor the solstice. And I very much agree— it's a contemplative time of year. Hope you had a wonderful, restorative Yule!